Photo by Jacob Vaughn| José Ralat stands in the back of El Come Taco, a Dallas Taquiera. Sizzling meat lightly rang throughout El Come Taco, a Dallas taqueria, as José Ralat arrived in an Uber. He stumbled over his words, speaking with a stammer as he greeted the owner. He has a speech impediment, and does not drive because of his epilepsy, which he was diagnosed with as a child. But that has not stopped him from traveling the U.S. for the last eight years in search of the best taco. Tacos are a staple of Mexican cuisine and Ralat is an expert on them. He is best known in Dallas as an expert on the folklore of the taco. Tami Thomsen, an organizer of the Taco Libre Festival, reminisces about the first festival nearly five years ago. “He appreciates a good traditional street taco as much as he does a contemporary taco. He’s quick to give praise yet not afraid to give honest criticism, which I admire,” she said. Ralat makes a connection with the local taquerias within the community. He travels and does his research tasting tacos far beyond Texas, she said. “If you want to know where to find a good taco almost anywhere, José is my go-to,” Thomsen said. However, there was a time when Ralat was not as acquainted with this Mexican fare. He lived in New York City in a Puerto Rican and Mexican neighborhood. Ralat had the best of both worlds. His wife, who is Mexican-American, made him his first breakfast taco chorizo con huevo y queso – a spicy Mexican sausage with egg and cheese. He fell in love with them. Around the same time, he tried “tacos de lengua,” or beef tongue tacos. Those two taco recipes changed his life. “A taco isn’t just a food,” Ralat said. “It means something. They tell a story.” His taco journey took his love for the Mexican snack to large publications such as D Magazine, the New York Press and Vice. He also co-edited the December 2015 Texas Monthly list of “The 120 Tacos You Must Eat Before You Die.” He writes “Tacology,” a column for Vice’s food website, Munchies. He is also author of “American Tacos: A History and Guide to the Taco Trail North of the Border,” which is coming out in early 2020. Each chapter is dedicated to a different taco style, laying out the history of how each was developed and who makes them. Ralat and his wife had a son in 2008. When life became too expensive in New York, they moved to Dallas, his wife’s native city. Ralat and his family stayed with his mother-in-law for a little over a year. In 2010, Mark Donald, then Dallas Observer editor, asked him to pitch a story about tacos. Donald asked Ralat if he liked tacos. “Who doesn’t love tacos,” Ralat said. The following Monday, Ralat pitched him what later became “Taco Trail.” For a year, he wrote columns based on taco reviews of Dallas taquerias, taco shops. “Taco Trail” went independent in 2011, and since then, Ralat has made a living traveling the country to review tacos from all different regions. After he pitched the column to Donald, Ralat quickly realized how much he did not know about Mexican cuisine. Friends sent him books from Mexico so he could become more educated on the food. “I realized how restricted people’s ideas were of Mexican food and what tacos are,” Ralat said. Jon Daniel, a friend of Ralat, has been a supporter of his work. When Ralat plans a trip to El Paso, Texas; Laredo, Texas; New Orleans; or San Antonio, Daniel travels with him. “He’s not just a restaurant reviewer,” Daniel said. He said Ralat is serving the community by educating it about an entire cuisine. “He lets people know there’s this whole cuisine out there if people just go look for it,” Daniel said. Ralat said: “A taco is three things: tortilla, el relleno [taco filling] and salsa. That is the holy trinity. You can’t have a great taco without a good tortilla.” If the tortilla is made from industrialized corn, the taco can still taste good, but it could not be considered a great taco, Ralat said. Another way to distinguish a good taco from a great one is the filling, he said. 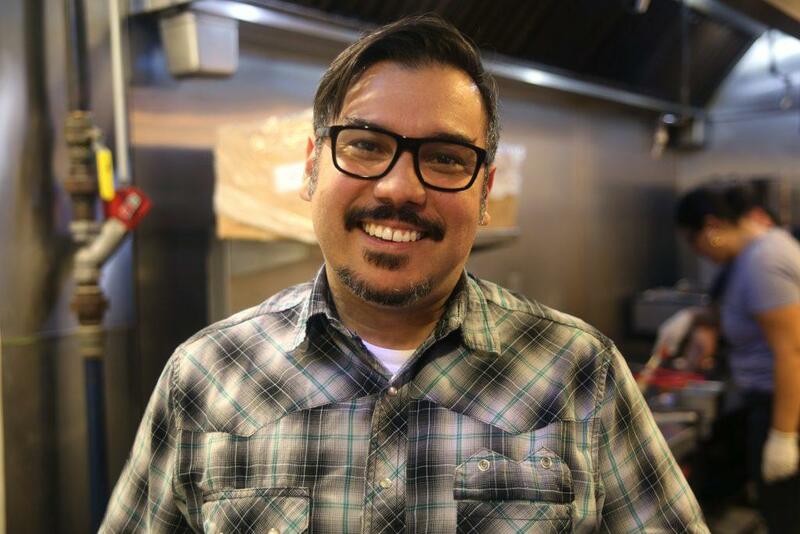 Ralat said he believes traditional taco filling recipes make the biggest difference: for example, if filling of carnitas, Mexican slow-cooked pulled pork, is not cooked in lard, they are not traditional carnitas. When Ralat reviews a taco or a taqueria, he takes all these factors into consideration. But if a taco tastes good to him, he throws the other criteria out the window. Despite being a Puerto Rican taco expert, Ralat has not faced criticism from the Mexican community. He said he has felt very fortunate to have been embraced by the Mexican and Mexican-American communities. He considerers himself a chronicler with opinions. “I am fortunate enough to do this, and fortunate to have the trust of so many people. It’s an honor,” Ralat said. He has also been invited to speak at conferences about his passion for tacos. “It’s an honor, and I hope it means something to others as well,” Ralat said. People are working hard to keep their business alive and the best thing a person can do is go out and support them, he said.